Yesterday, I shared out a collaborative music project that I have been involved with as part of the Mastodon federated network. A Whale’s Lantern brings together and connects random musicians, and then they work on the writing and recording of a song together over distant communications. 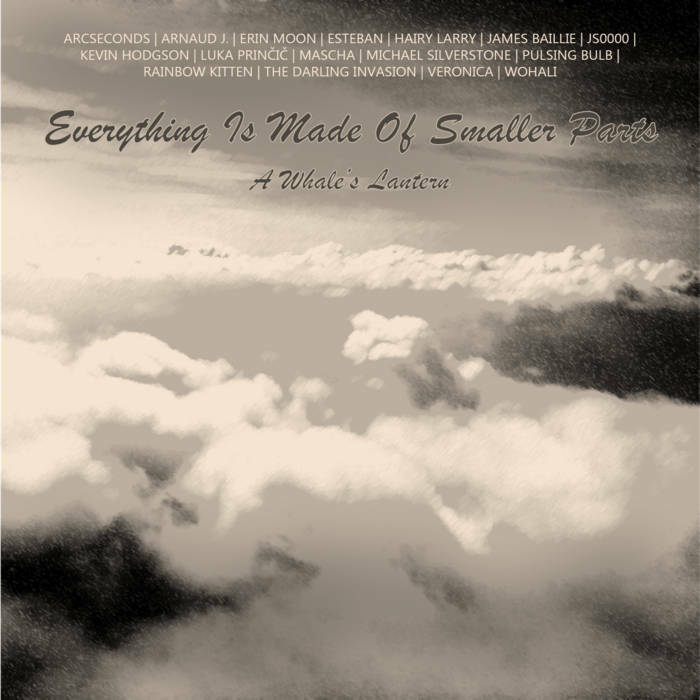 The first round of A Whale’s Lantern (entitled Flight Into the Nebula), I did a song with my friend, Laura, and this second round (entitled Everything Is Made of Smaller Parts), I collaborated with Luka. Luka and I created a song called Alchemist Dream, based on some earlier interactions with Networked Narratives on the theme of “digital alchemy.” The theme of A Whale’s Lantern was “the elements,” so I worked those two strands — alchemy and elements — together in the initial demo I sent Luka, who then transformed the music with his own magical abilities. The second round of music by collaboration — known by the project title A Whale’s Lantern — has now been released, and the theme of the musical pieces was The Elements. 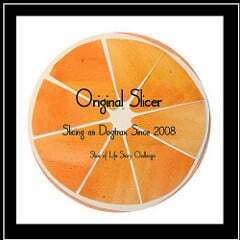 The album is located for listening, and for downloading, at Bandcamp. The whole project is built on collaboration — from the songwriting, to the recording, to the production. Each song represents a different collaborative partnership. I was paired up with Luka, an amazing engineer and musician from Eastern Europe, and we worked together on a song called Alchemist Dream. I wrote the lyrics, inspired in part by the Alchemy theme of Networked Narratives, and Luka wrote the music, and then we worked via email and other means to merge the two pieces together. I sing the song, and added some sax at the end, but Luka has done everything else. The back and forth we had was intriguing in many ways, and I am pretty happy with how our track ended up. Luka deserves much of the credit for the production value, as he spent hours working on it. If you are wondering how this all works, a call went out from our friend Mascha in the Mastodon networking space (this is the second round; the first round is entitled Flight into the Nebula, and I worked with Laura on a song I wrote called I Fall Apart). Participants are given rather random partners, and an extended period of time to work together. Some partnerships don’t get the finish line for all sorts of reasons. This second round had more completed tracks than the first. 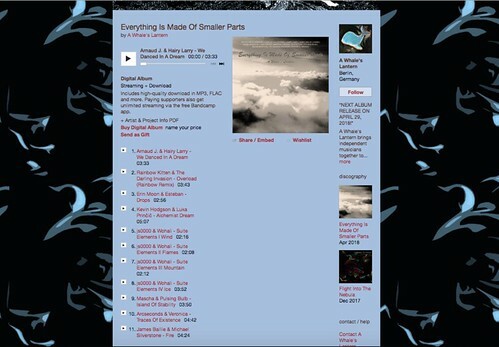 The songs are then pulled together (by Mascha, who is the heart and soul of this project) on Bandcamp for sharing, and for purchase, with some proceeds going back into supporting the Mastodon network. I hope you enjoy the music and the stories of how these pieces came together. Indeed, everything is made of smaller parts. My guitarist friend passed me the large envelope and asked me to become its “owner.” I looked inside. 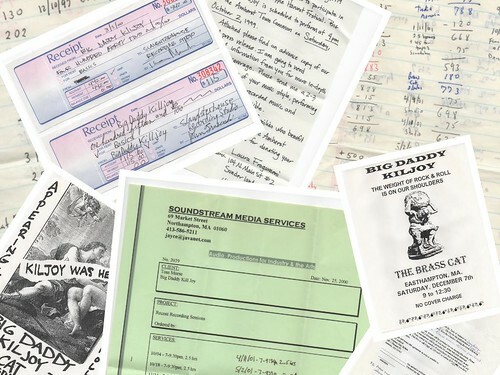 It was filled with documents from one of our earliest rock and roll bands (Big Daddy Kiljoy). There were contracts for gigs, paper fliers that we used to put up around town, receipts from studio recording sessions, and more. It was a travel down memory lane, for sure, and I digitized all the documents at home, and created the collage for him, and the drummer. The three of us — now nearly completing the formation of another band with the possible addition of a bass player — have been making music for more than 20 years, and it all began with the rag tag rock and roll of Big Daddy Kiljoy. Wanna hear some from the archives? I wrote and sang the first song, and our friend, Tom, now deceased, sang the second song, written by Bob, the drummer. This is the second of two parts of a post about an online musical collaboration project known as A Whale’s Lantern that has been taking place on the Mastodon social networking space (part one is here). Musicians are randomly paired up, and asked to create and record original music and songs. Those songs are then pulled together for an album on Bandcamp. This oral history project took place in a shared document after the first iteration was completed. A second round, with many more musicians, is now underway, with a new album scheduled to be out before the end of April. Yesterday, the reflections centered on participants first reactions to the call for collaborations and how they made and nurtured connections with their collaborators. Today, we focus more on the making of music, with both the challenges of online connections (where musicians are not in the same physical space) and the possibilities of this kind of creativity. You can listen to the first album at Bandcamp. Buying a track will support the artists and the federated and open Mastodon network. Veronica: I linked my old demos to Robert and he liked them, so it was kinda naturally decided to work on one of them. Matheus: I am usually compose alone, so yeah, I was very afraid of making mistakes and letting my partner down. Wendy: I had direction of ‘animals from another planet’. C minor and dark. The first track I produced was sounds from my clarinet rather than a song. Laura: Kevin had the kernel of the song, but it changed and I heard more than he put in that first outline. I wasn’t sure how he would react to having all new lines in the chorus and bridge sections. Robert: As soon as the stems arrived … I was with the art. Laura: What you write can be deeply personal, and collaborating, especially at a distance, requires trust. I am glad Kevin trusted me to sing. That meant more than he could know. Matheus: I believe I was the youngest of all of the musicians who were involved in the project, so I was worried I would not be able to reach their level of knowledge or skill. Veronica: For this particular album, it is fair to say that mainly he (Robert) did all the work, giving a slightly different shape to a song that I simply wrote some time ago. Mascha (collaborating with Matheus): After exchanging a few emails, I sent him a chord progression and some other guitar recordings with effects on them and then, over the course of the project, we both added tracks and parts etc. Matheus: I let Mascha come up with some of her ideas before I suggested anything. I think that was a wise decision since the first melodies she released were very original and shaped pretty much everything I came up with later on. Robert: Veronica’s song that most resonated with me was Blueness. My priority was blending supplemental instrumentation in with the initial folk feel of Veronica’s vocals and melodies, to reflect and expand in the mood. Mascha (with Matheus): We really started from nothing and co-composed the entire song via email and whatsapp, which was a very interesting experience. Laura: Timing wasn’t really a problem at all. I think for Kevin, not knowing exactly what I’d do with the guitar foundation, it was the waiting, until I returned the next stage of the song. Mascha (collaborating with Michael): Michael sent me a few of his song sketches and I chose one to work with. The acoustic guitar part in the song is still from that first sketch. The idea for the lyrics evolved from me reading a Wikipedia article on the distant future of the universe. Michael: Mascha had some lines she invited me to add to. I tried to keep as close to the original as possible, but also try to help it to fit the melody and rhythmic pattern of the song that was developing. Kevin: Every interaction we had was positive, and constructive, and I never felt as if her musicianship overpowered my ideas for the song. Mascha: Working with Matheus was very pleasant. He’s really good at giving feedback and evolving ideas. Matheus: Even though she (Mascha) was very busy, she took the time to answer to all my looong e-mails and messages, giving all the feedback I needed. She deserves a medal for having that much patience with me. Veronica: Robert tried very hard to keep my vision of the song. Robert: The easiest part was enjoying the process! Veronica’s capturing of moods is refreshing! Mascha: Since we (Michael and Mascha) started from a lyric-less song that he had already written, the “come up with a song”-part of the collaboration was quite quick. Michael: Early on, I decided that finishing the song was way more important than pushing any particular vision of how I thought it should be. I would suggest ideas if asked, but was willing to let Mascha decide what and how she wanted to contribute, and I would make sure keep from complicating the effort . Mascha: I think Michael and I have quite different communication styles, so that was a bit difficult to navigate – I’m very happy that we were able to sort things out, though. Wendy: The difficulty was the invisibility of my collaborators and the work of others. I had no sense of what other people were working on. Hugh took my first track and did an amazing remix. Kevin: Articulating what we were hearing in the mixes — in different headphones and speakers, many miles away, in email conversations — is challenging. I think we were open enough and support enough of each other that it all worked out fine. Laura: The tables would have been turned 180 degrees if I was the one who had written the underlying chords/skeleton. Then I would have felt the pangs of time and distance. Matheus: Another thing is that I’ve never recorded anything before, so my tempo was off way too often. The last straw was the Udu (which is the main percussive instrument on the song). The problem with the Udu was that, well, I’m not a percussionist, which means I have focus really hard in order to keep the beat flowing. Robert: The accents on Veronica’s notes are different in nuance than what people often do in my city, and it was refreshing playing the bass line to be tripped up by “wait, this part at the root feels different than what I initially heard it as,” and then staying true to the space and time of the source music. Michael: If we had developed the foundation melody jointly, I think there would have been a musical communication that developed through the process of improvisation and negotiation. Since we began from something I already “completed”, the communication and negotiation of a shared vision had to happen in responding to how the other person had changed the song in ways that we didn’t expect, or didn’t match what we thought was “right”. Matheus: It was really nice to see the song developing and in the end it became something that wouldn’t be possible if I had tried making it alone. It was a really eye-opening experience and I felt great through the whole process. I would like to thank Mascha for bringing us together and for being such a great partner. I hope to be a part of the next edition of this project! And bravo to all the other artists, who did a wonderful job with each of their songs! Thanks for reading and for listening. Now, go make some music! 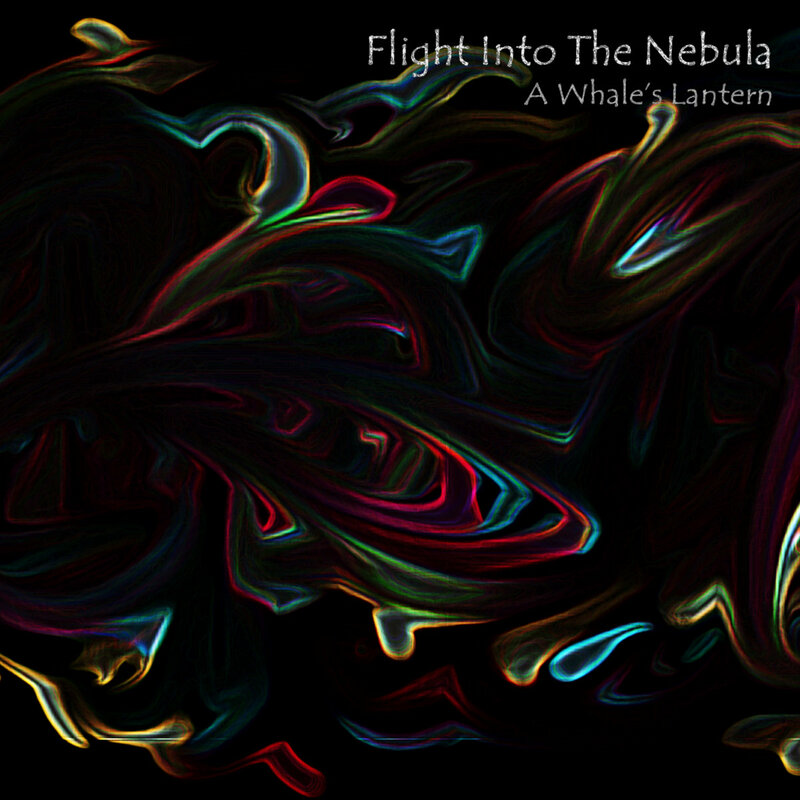 Keep an eye out for the second round of songs for A Whale’s Lantern in a few weeks. How best to harness a federated networked space like Mastodon for creativity? Many of us are still figuring out what it means to have our toes in an emerging platform spread out across many “instances” and homes. A Whale’s Lantern, a collaborative music-making venture that unfolded over the final months of 2017, emerged, as so many interesting ideas do, from inquisitive inquiry and open invitation. What would happen if relative strangers in an openly networked space made music together, virtually and collaboratively, and then published the album togetheron Bandcamp? Mascha put out that call on Mastodon in late September 2017, and the collective writers of this article responded. A few others were also involved in the early days of collaboration, but for a variety of reasons, including life itself, made deadlines difficult for some collaborators. So eight potential pairings, aiming for eight songs, ended up as four collaborations with four songs (with hopes that those who could not collaborate for this venture might join in future projects). We are now nearing the end of the second iteration, with a new album due sometime this spring. I’ve been teamed up with an amazing musician and producer, Luka, who is finishing up our track, which he created music for and I wrote lyrics for, and did the main singing on. He may be adding other cool flourishes as well. I get a listen every now and then, and it’s so neat to hear how he is building our song. This particular oral history, documented through a shared file (and slightly edited for length) of A Whale’s Lantern is an aim to celebrate how it all first came together in the initial gathering, and how it might be a model for other creative collaborations in the federated Mastodon network. You might even call it a jam session of reflections and memory. In this first part, we share ideas about Invitations and Connections. Tomorrow, in part two, we share ideas about Collaboration and Considerations. Embedded songs are connected to the participants who wrote/performed on them. Mascha Bartsch: I posted the toot, so I was just very excited to see whether anyone would actually sign up. Kevin Hodgson: I’ve done plenty of collaboration projects, including music, but those always stemmed from projects where I mostly knew and interacted regularly with participants. Here, I figured it would be relative strangers, and I felt a little uneasy but excited. Veronica: The first time I saw it in September, I thought: “Cool idea! But I’m kinda away from the music right now.” Then I thought: “Hey! I can do that! I’m not particularly skilled but I can do that!”. Robert Vavra: I saw the potential to contribute … Naturally, I jumped at the opportunity. Michael Silverstone: I didn’t actually see it, but I heard about it from Kevin. Wendy Taleo: I didn’t see Mascha first toot. I saw Hugh’s toot that had #musiccollab in it. I checked out that thread and saw Kevin and Laura there who I knew from my open study over the last couple of years. Matheus Violante: Well, I was new to Mastodon and I am still very inexperienced when it comes to music, so I was like “You know what? It’s time to try something new!”. Laura Ritchie: I thought: yes, this (Mastodon) is a nice place to be, and why not? Matheus: I saw the post as an opportunity to integrate with the community and learn how to compose a song with a partner. Michael: I’m always delighted to see what happens when working with other motivated people who can do things that complement or go beyond what I can do, so naturally, I was excited to be part of a project like this. Mascha: I think that it’s important to be aware that collaboration does not always work and that you might be paired up with someone you don’t click with or someone who is unresponsive … I had a pretty relaxed attitude towards the entire project (and my collaborations). Kevin: I knew that Laura as an amazing musician. So I felt sort of intimidated. Not by her personally. She’s not like that. But by her chops. She’s in another league. So my worry was that I would not be able to contribute in the ways she could contribute. Laura: I knew Kevin, but we have never met. Wendy: No concerns really, it would either work out or not. When I looked at Hugh and Lukas profiles it was a bit daunting….they did this for a living. Mascha: If it works out, great, if it doesn’t, not much would have been lost (except a little bit of my time, but that’s a bearable risk). Michael: I thought it would be easy to generate ideas and hold a musical conversation. That part proved true. Veronica: I filled the form and got terrified instantly: “I’ll be paired with a REAL musician and I might let them down.” But I submitted the form anyway and I’m really glad I did. Robert: My only concern was finding out how to fulfill an artist’s vision that I’ve never met and hadn’t felt the mood of in person! Stay tuned tomorrow for Part Two of the Oral History of A Whale’s Lantern project. I’m always a bit curious about online music tools. This new one, via Chrome Music Lab, is simple but fun. It all loops. This is the song that I made. Make your own music with the tool and be sure to share it out. My 13-year-old son and I continue to make music together, with him starting songs and inviting me to collaborate. I am enjoying the opportunity to engage him with some creative collaborative practice, and it’s been fun, watching him learn about music creation with technology. It’s become a real passion for him. This song is the second one we did together, using audio clips as loops for a message of hope. You can still hear the songs on one surface map, and I added some text for context. My friend, Wendy, and I were over other possibilities at the time (I had this vision of an AR overlay) and I wonder if yet another project Wendy and I and a few others are planning might give me some ideas to revisit this sound map later on. We’re more than half-way through a professional development session on learning how to best use Google Classroom. The session is being run by my colleague, Tom Fanning, from the Western Massachusetts Writing Project. I’ve been using Google Classroom since the start of the year, but I asked our district to consider PD for other teachers, since I was getting a lot of inquiry from colleagues about how it works and why use it. The session has nearly 20 teachers from our entire school district, and Tom has us making pilot Google Classroom spaces, inviting each other in as small groups of “students” to play the role of learner. My group has three other elementary teachers, and as I was working on their assignments — a cell analogy project, a state history project and a notable African American biography (and mine is a Parts of Speech project) — I decided to keep to a common theme of music across my work. My cell analogy project used a musical score as the point of comparison. I chose Taj Mahal as the Massachusetts history project, since he is the state Blues Artist. And I researched John Coltrane’s musical legacy for the biography project. Look. Google Classroom is a fantastic work management tool that my students enjoy using and which has certainly made my work as a teacher a whole lot easier. It’s also clearly another finger reaching out to grab more Google users. We talked about this in our PD session and I talk about it with my students. Google wants to nurture young eyeballs for later in life, when it can target them for advertising, and make money. To think otherwise is to delude ourselves. For now, I see more positives on our end than negatives with our dive into Google Classroom, but it’s always important to keep the larger perspectives in focus, on what we give up when we use free technology with our students. I’m glad we addressed and debated Google’s mission and motives in our PD. We can all move forward, knowing to some degree what we and our students are getting into. The other day, my 13-year-old son says, Dad, do you want to make a song with me? You bet I do, kid. When we were done with the collaboration, I took the audio file and used an online site to create the video, to make the presentation a little more impressive (mostly, for him). Anytime your 13 year old asks, Do you want to … — the answer should almost always be Yes.